I would not have believed that creating disk hangings could be so diffcult. Firstly, the hoops themselves. 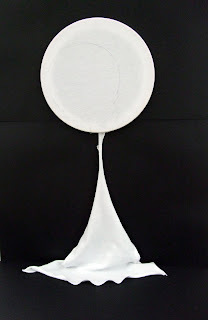 Creating two ply 'hoops' at approximately 150 cms wide and 13 cms deep (previous blog), with the help of my husband gives me the starting point I need. The difficulty, then, is in how to exactly tension the fabric over the disk so that it looks professional. Di has suggested a series of pleats. More sampling needed. Metal bar, in process. Again, the problem of fixing the fabric to the disk. As the tankers are made from metal, I like this idea. I am hoping to rust the mild steel and seal them, allowing them to show through the silk. I have ordered fibreglass rod used in kite making to try. 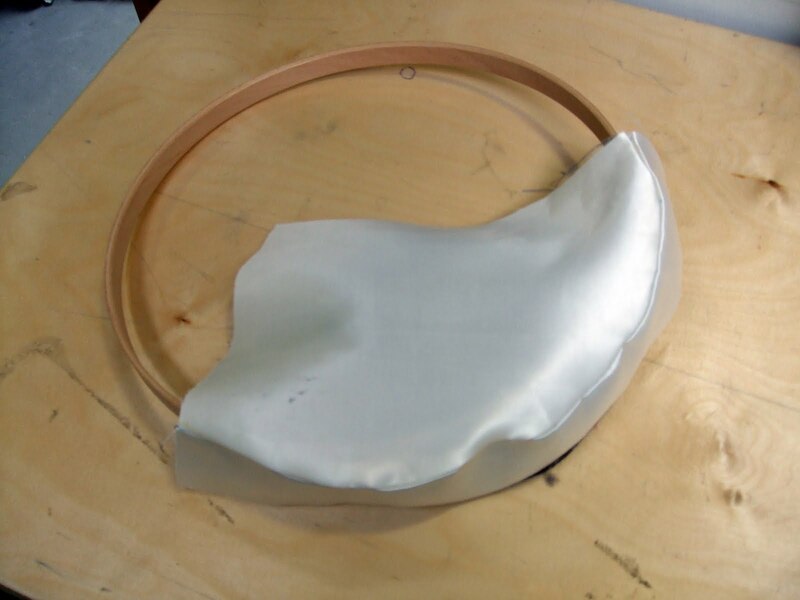 This sounds like the best option because I can create a seam around the circular design and thread the hoop around. What I am trying to do is to create a disk hanging with a printed design where the disk and the 'trail' are one piece of fabric, the 'trail' being the contents of the tanker. This sample on cotton jersey is made just using elastic (easy removel for cleaning). The line of the elastic shows through so I will need to either make the disk a feature or use 2 layers of fabric. I am working on creating smaller disk hangings where the 'contents' flow to the ground and spread out over the floor. Creating a seam around a circle is so difficult. I discovered that I must stitch a border piece of fabric on to the disk first. Di showed me how to 'notch' the circular piece of fabric, and fit the band of fabric around that, matching the notches. Matching short lengths between the notches ensures that you keep the tension in both pieces of fabric equal, avoiding puckering. 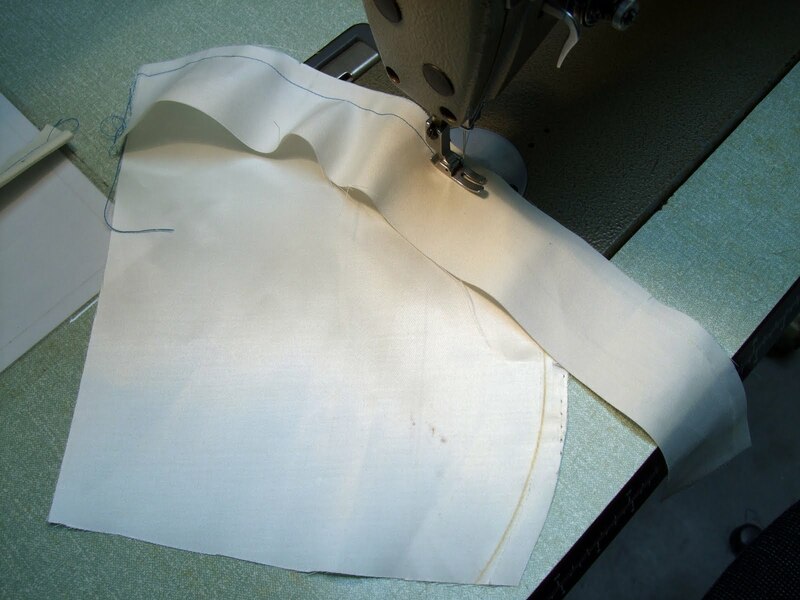 I was so impressed with using the industrial sewing machine. This creates a border 'band' or 'edge'. My problem with this is that the precision needed to make sure that the seam is exactly on the edge of the disk will be so difficult. Otherwise it will look tacky. Does the fabric need to be stretchy? Silk? (which is what I would like), Does it need to be opaque or translucent? Does it need to be double or single.